Good Wednesday morning and welcome to the CLASSroom. Halloween is just around the corner and is a time for fun treats and party favors. I have two products to share with you today that help make fast and easy bags and containers. First is the Avery Elle-ments Treat Tag and Box. Fold and score along the score lines. Apply double stick tape to the bottom of one box section and adhere to the second box section. The box is three inches square and the perfect size for candy and cupcake Halloween Treats. I filled mine with candy and decorated the tags with with assorted Impression Obsession Halloween dies. My second set of projects were made using the We R Memory Keepers Goodie Bag Guide. The gingham paper pattern for the bags was printed on printer paper. You could use printed designer paper, glassine or vellum. The guide is made up of four sections that allows you to make various size bags. You can make the length of your bags as long or short as you would like. I used section A and D for my six inch wide paper. My finished pencil bag is 5.50” long and my finished pen bag is 3.00”. Lay the guide over the paper and lining the edges up on both sides at the six inch mark. Press firmly on the guide to hold it in place and begin tearing the paper slowly and gently and work your way to the center. Go over to the opposite side and repeat the tearing process until you work your way to the center. Move the guide straight down the paper to the length you would like your bag to be, keeping it in the same position and repeat the tearing steps working from the bottom of the paper. There is a special notch on both sides of the guide that signify the scoring line for folding the bag. See the arrows on the photo. Line the guide up on both ends of the paper and fold and crease it against the guide. Repeat on both sides of the bag. Line the guide up on the bottom of the bag and allow a small portion on both sides of the paper to be included in the fold. Apply double stick tape to one side of the bag and attach to close the sides together. Apply double stick tape to the bottom and fold up to close the bottom. Note: I folded up a little more on the bag in the photo than I had originally planned to make it fit my pens. Have fun decorating your bags. You can check out the Oh Goodie Bag Guide video tutorial on You Tube for a closer look. Thanks for coming by and I hope these projects have inspired you to make your own Halloween treats. Aren't these Mama Elephant New Family forest animals the cutest?!! This stamp set is geared towards a new baby or baby shower, but here's how I turned it into a Fall themed card . . .
First, I stamped two of the foxes onto Prima Marketing's 140 Lb. Watercolor Paper Pad -- I love that you can just open this paper pad and start working on the 6x6 sheet(s). The pad has a glue binding on both the top and bottom of the pad, which is meant to help keep the watercolor paper from warping while you work with a wet medium ... genius! After stamping, I used my wide (4mm) Molotow Masking Pen to cover the images, so I could put my watercolor background wherever I wanted, leaving the animals to be colored as I wished later. The blue masking fluid goes on very smoothly! Then I used a water brush to blend the stamped ink. TIP: Blend only one color at a time (moving to each spot you have stamped that same color), being sure to clean your brush between colors so you don't end up with mud! Once the masking fluid was dry (it doesn't take very long) I repeated the leaf stamping process, using only the tips of the floral stamps to add some fallen leaves beneath and around the foxes. I also stamped a baby fox nose-to-nose to its Mama! The masking fluid allows the baby to appear as if it is wrapped up in Mama's tail! Next, I stamped the bunnies onto watercolor paper and colored them with Hickory Smoke Distress Ink and used Spun Sugar Distress Marker on their ears. Their coordinating New Family dies were used to die cut them, then they were popped up on foam tape. The 6-inch watercolor panel was trimmed down to A2 card size of 5.50" x 4.25". Is Fall in full color in your part of the country yet? It's just beginning here in south Texas! Hi Friends! Carly here today for #throwbackthursdays, where we find inspiration in The CLASSroom archives! Today I'm excited to share a fun Halloween project! To create this project, start by stamping a sentiment in StazOn ink on a piece of 5-1/2 x 3-1/2 acetate. When ink is dry, insert acetate into the bottom of a storage pocket. Add fun shaker pieces like sequins, spiders and stars. Use Fuse Tool to seal pocket above acetate, creating a big shaker pocket. Humble tip from me: I have used a non-stick craft sheet and a glass mat to Fuse but I just picked up a Fuse Mat and it is so much easier to use! I highly recommend adding it to your tool collection. It clings to your table to prevent slipping, has a holster for your Fuse Tool but best of all, the surface helps the Fuse Tool glide along, prevents over or under melted spots. Making the washi tape is so easy! Cut a piece of double-sided adhesive to fit the flap. I cut mine a to fold over and cover both sides of the flap. Remove liner paper from one side of adhesive and apply tissue paper to the adhesive, using a bone folder to smooth out any bubbles. Trim away any excess tissue. Stamp tissue paper and let dry. Remove remaining liner paper and apply to flap of storage envelope, folding over to cover both sides and trimming away excess. After the flap is adorned with the DIY washi, fill the pocket with treats! Then it's time to create a closure. You can fold the flap inside the pocket but I wanted a little more security so I used a small piece of velcro. Fold up, secure with twine and add a little tag. Then give to someone who deserves a treat! I can't wait to make more! Wouldn't this be cute for Christmas treats?! Isn't it yummy? Those colors? Gelatos®, my dear friends. Let me show you what I did. Sound good? Great! Let's get started. I'm using Ranger's watercolor paper (the smooth side) for ease of blending and since it takes the water really well. The Gelatos® colors I have here are Iced Chai, Iced Coffee, Gold, and Tangerine. I then also added Blood Orange for additional depth. Scribble the Gelatos® colors onto the watercolor paper and then blend with your fingers as shown below. Mist the blended color heavily with a mini mister, allow the colors to drip, and blend into each other, and allow to dry. *TIP - If you are dissatisfied with the way the colors have dried you can always add more color AFTER it is dried. I added more Blood Orange to mine, misted again, blended again, and dried again. Using the Gelatos® Gold twist up about 1/4" of the product and use a palette knife to cut off the product onto the work surface. Smash the product onto the work surface using the back of the palette knife. So, now here's when one of the awesome things about Gelatos® happens...because they are water soluble you can mix them with OTHER products to achieve a new look. And that means that products that normally are NOT tinted can now BE tinted. Such as Whipped Spackle. But, it's also important to note that since Whipped Spackle is opaque, that mixing the two products will cause it to lighten. Whipped Spackle is a texture medium from Faber-Castell® Design Memory Craft® that is very light, very fluffy and I've heard it described it to be the consistency of "frosting". It is exceptional with stencils, but can also be used any other place you desire texture on your cards or mixed media. Now mix the Whipped Spackle with the smashed up Gelatos® Gold and spread over random areas of dot stencil (or stencil of your choice -- it's a free world!). I noticed that there still wasn't as much vibrancy as I would have liked so I added a spritz of Dylusions Ink Spray in Squeezed Orange and let it drip. And before it was dry, I also spritzed Ranger Perfect Pearls in Perfect Pearl which made the Dylusions Spray blur out and do magical things. So pretty! I trimmed the piece down, flipped it vertically, die cut a leaf from one of the trimmed pieces and created the card you see at the top of the post. The little dots on the side and the sentiment are Essentials by Ellen LLC Autumn Acorns, Designed by Julie Ebersole. Then I rounded the bottom right hand corner for extra interest. Easy-peasy! I hope you learned just a teensy bit more about Gelatos® today that will make you take them out and use them more. Have a wonderful day and I'll see you in TWO WEEKS! Hey everyone! It's Carissa and I'm so excited to be here for another Satur-YAY! Satur-YAY is all about celebrating the weekend by getting our craft on. And today we're going to get gourd-jus for fall! I have a couple of projects that are quick and easy and will be perfect for Thanksgiving or any fall celebration. Let's get going...I have a lot to show you! I'll walk you through both of these projects in the video tutorial below, so be sure to check it out! I'm starting with the Essentials By Ellen Gourd-jus die set. I love the hand sketched feel of these dies. The images are perfect for fall, but I also spy some images that can be used year round. I think the pumpkin is my favorite. I used the Gourd-jus dies to cut some watercolor card stock. When I was cutting, I was careful to allow the die cut to remain within the negative space of the paper. This makes it easier to quickly watercolor all of the images at once using some Distress Stains. Once the images were cut, I used some clean water to wet the entire surface of the watercolor paper with the images in the negative space. Then comes the fun part! I dabbed some Distress Stains right on the paper. I used several colors in fall tones to create some beautiful watercolor pieces for the front of my card. I used Fossilized Amber, Wild Honey, Peeled Paint and Frayed Burlap. The damp surface of the card stock allows the colors to mix and blend as you dab them on to the paper. If you want to soften any areas, you can go over those areas with your damp paint brush. To intensify areas, just add more stain. To add a touch of elegance and shine to my die cut pieces, I edged them with some gold embossing powder. To do this, you can dab the edge of your Versamark ink pad directly to the edge of the die cut pieces. If you prefer a little more control, or if you really want to get in every nook and cranny, you can use a makeup sponge to dab the Versamark ink on to the die cuts. I then sprinkled on the Ranger Super Fine Detail Embossing Powder in gold and heat set it. This adds a a bit of glam to these very organic images and dresses them up for the holiday. To create my sentiment, I used the Thankful stamp set. I chose to cut the sentiment stamp so I could just use the thankful part. However, if you're not crazy about cutting your stamps, you could always mask the stamp instead. I stamped the greeting on some Essentials By Ellen vellum in Versamark ink. I added the same Ranger Gold embossing powder and heat set it. I love that repeating the same gold on the sentiment and the die cut images really pulls them together. For both of my projects today, I used the Lawn Fawn Small Stitched Rectangle Dies. These dies are so versatile and the stitched detail really adds just the right touch to any card. I used the largest rectangle in the die set to cut my card front. I used the second largest rectangle to cut my place cards. To add even more detail to my card front, and to give my grouping a grounding point, I de-bossed a label shape on to the card front. Finishing the card was easy from there. I attached my leaves to the card front using some liquid glue. I attached the punkins using some foam adhesive. To attach the vellum sentiment, I used a tiny bit of Multi Medium Matte behind the embossed greeting where the adhesive would be disguised. I embellished with some sequins from Pretty Pink Posh...and voila! A quick, easy, Gourd-jus card for fall. I hadn't originally intended to make place cards, but I had to make use of the leftover shapes I had. The Lawn Fawn Stitched Rectangle dies were still laying on my desk and the idea hit me like lightning. Now, I'll admit, I tried really hard to hand write the names on these place cards...but I'm just not crazy about my handwriting. So I cheated. I printed the names on some vellum using my laser printer. I used the Euphoria Script font, in case you're wondering. I then used my Minc Mini to apply some Rose Gold Deco Foil. The slightly muted gold was a beautiful addition to the place cards. I didn't walk you through the entire Minc process in the video below...but you can check out this previous SaturYAY to see exactly how to use the Minc. To finish the place card, I slid the name banners right underneath the grouping of die cuts and attached them with some Multi Medium Matte. Then, just like the card above, I finished the place cards off with some Pretty Pink Posh sequins. And I just LOVE the hint of sparkle these will add to my Thanksgiving table. I may have to make these for the Christmas table using the Poinsettia and Pine Die set too! Don't forget to check out the video tutorial below. I'll walk you through these projects and give you some extra tips and tricks along the way! I've also linked the supplies below so you can quickly find them in the Ellen Hutson store! So there you have it...some Gourd-jus fall projects, just in time for Thanksgiving. These projects came together quickly and could easily be replicated over and over again! Now it's your turn to get YOUR craft on! Put on your stretchy pants, grab a cup of coffee and dig in your stash and start creating! I'd love to see what you're making this weekend. Be sure you snap a quick pic and share on social media using the hashtag #EllenHutsonSaturYAY so I can check them out! I can't wait to see what you're making! Thanks for stopping by today. I hope you've been inspired to create something...anything...this weekend. I'll see you next month for another SaturYAY. Until then, I hope you have a fabulous day! You can watch this video in HD on our YouTube channel by clicking HERE. Don't forget to subscribe so you won't miss any of our fab tutorials. With October almost over, it's finally starting to feel a lot more like Fall down in Texas, and I'm looking ahead to Thanksgiving today! I hope this simple watercolor technique will help put you in the Fall spirit, with these pretty die cut gourds and leaves! For best results (and less chance of muddy colors), keep the ink pad colors within the same color family. Here, I used Spiced Marmalade, Fossilized Amber, and Ripe Persimmon. 2. Repeat the dipping technique to achieve more depth of color and cool patterns! 6. To finish my card, I dry embossed a panel of Bazzill Butter Mints cardstock with Taylored Expressions Burlap Embossing Folder, trimmed the panel to 4" x 5.25" and adhered it to a Butter Mints card base. Next, I arranged some of the watercolor die cut pieces on the card front, using X-Press It Foam Tape to give some variety of depth to the pieces, and added a Bazzill Peanut Fudge hand trimmed banner, gold heat embossed with the beautiful Thankful sentiment from the Essentials by Ellen Thankful stamp set. Hi! It's Carly and I'm here for another #throwbackthursday! 1. I started with a 4-1/4 x 5-1/2 piece of Solar White cardstock and used the large Pan Pastel round sponge to cover the whole surface in Pan Pastel Turquoise Tint 580.8. 2. Next I placed a dot stencil over my paper and applied VersaMark ink through the top left edge using a Mini Ink Blending Tool. 3. With the same large sponge, I applied more Pan Pastel Turquoise Tint 580.8 over the VersaMark dots. The VersaMark ink is so sticky that the Pan Pastel sticks to the ink, revealing a subtle pattern. 4. Next I stamped a leaf from Essentials by Ellen Clear Stamps, Thankful set with VersaMark. After stamping I applied Pan Pastel Orange 280.5 and Permanent Red 340.5 with a pointed tool. Again the Pan Pastel sticks to the VersaMark ink. I repeated the process with two more leaves. 5. When I was happy with my pastel panel, I sprayed it with a little hairspray (it was the only fixative I had handy, lol!) and then I die cut a few strategic leaves out of the panel with the Essentials by Ellen Designer Dies, Thankful set. I machine stitched the die cut leaves and set aside. 6. I cut my pastel panel down to 4 x 5-1/4 and adhered it to a 4-1/4 x 5-1/2 folded Solar White card. I added my stitched leaves back to where they were die cut from, bending them for texture. 7. For a sentiment I stamped and embossed in white "Happy Fall" from the Essentials by Ellen Clear Stamps, Autumn Acorns set on black cardstock. I cut the end to a fishtail and adhered it to the card with a little nest of white thread underneath. Hi! It's Carly here for another #throwbackthursday! I created the book from tags of all different shapes and sizes, with lots and lots of gold. I've started to add photos & journaling and I plan to complete it as the season goes on. To create the polaroid tags, I used the Impression Obsession Dies, Instant Photo Frame. I die cut two photo frames from Solar White cardstock and one from Craft-a-Board. Then I made a "sandwich" with the Craft-a-Board in the middle. Then I added a hanging tag to the top made from kraft cardstock cut to 1/2" x 3/4", folded in half and hole punched. To create the 3x4 vellum tags, I used the WRMK Pocket Scrap Starter Dies and die cut the Seven Paper Amelia vellum with gorgeous gold dots! I added a kraft circle to the top on both sides and used my Crop-a-dile to punch a 1/4" hole through the entire thing. To create the 4x6 foiled kraft tags, I used the WRMK Pocket Scrap Starter Dies again and die cut papers from the Bazzill 6x6 Paper Pad Specialty Kraft With Gold Foil. Then I added a tag to the top made from kraft cardstock cut to 1/2" x 3/4", folded in half and hole punched. Just for fun I filled a glassine bag with sequins and die cut leaves from the Essentials by Ellen Designer Dies, Thankful set that I watercolored with Distress inks. I sealed the bag, added a circle of gold glitter cardstock and used my Crop-a-dile to punch a 1/4" hole through the whole thing. And thanks to Miss Julie and all of her awesome Fuse projects, I want to use my Fuse Tool for everything, so I also made a glitter-filled pennant. To attach it to my binder ring, I just cut a piece of kraft paper to fit the length, scored in half and hole punched it. Then I adhered the glitter-filled pennant along the inside edge. Bugles represent the cornucopia, a horn of plenty. Pretzels represent arms folded in thanks and prayer. corn per day because food was so scarce. if they are planted and well-tended. Fruit is a reminder of the harvest gifts from the land. M&Ms are for Memories of those who came before us. and friends that sweeten our lives. This mix perfectly filled a medium sized acrylic jar I found at WalMart which measures 7.25" tall x 5" wide. You could easily split this and have enough for two different gifts, or double or triple it for more shareable goodness! I just put the poem in a Word document with a pretty font and printed it onto Neenah Natural White cardstock. Then I die cut it with Taylored Expressions' Sack It-Pumpkin die. I decorated the pumpkin with pretty Fall images from Essentials by Ellen Autumn Acorns stamped in Memento Tangelo, Rich Cocoa and Rhubarb Stalk inks. The pumpkin stem was cut from Neenah Desert Storm and the leaf from Bazzill Gumdrop cardstock. The tag is tied to the latch of the jar with Natural Hemp Cord. Wishing you a happy Fall! Satur-YAY! 9.26.15 Peek A BOO! Hello everyone and happy Satur-YAY! It's the weekend and there's no better way to celebrate than by getting your craft on! Today, I'm creating some Halloween themed projects and while creating, I decided it was time to step out of my A2 sized card box, and create something a little different. So in today's Satur-YAY video, I'm going to walk you through three projects. I'll start with a card and then translate that card into a tag project and a treat box. I started by stamping and coloring the images from the Got Candy? stamp set on Smooth Bristol. Thanks to Nichol Magouirk, I've discovered that the Smooth Bristol is fabulous for Zig Clean Color Real Brush Marker coloring. I love my Clean Color Brush Markers, but had been having trouble achieving the blend I wanted on plain card stock. The Smooth Bristol has changed my world, and allowed me to get fabulous blends with these markers. I loved them before, and now I cannot live without them! I'll show you the difference between the blends on Neenah and Smooth Bristol in the video below. I like to stamp and color multiple images at once. I can then cut them out and have them ready for other projects that I might want to create. In this case, it worked out perfectly to have extras on hand to create my treat box and tag. To add a little texture to the plain white card base, I used the Hero Arts Woodgrain background stamp by Lia Griffith. I used Soft Granite ink and stamped it off on scratch paper prior to stamping it on my card front. This gave me a very soft impression on the card front and added just the right amount of texture. This background stamp can be used year round to create subtle texture and interest on your projects. You could also use the Essentials by Ellen Woodgrain Embossed card stock to achieve a similar effect (I'll link that below so it's easy to find). To create the window on the front of my card, I used a partial die cutting technique. This is a fun way to get more out of your dies. Partial die cutting opens the door to so many possibilities. My favorite tool for partial die cutting is the On The Edge cutting pads from Sizzix. These smaller cutting pads allow me to position dies in various positions and achieve more precise cuts than I can with the standard cutting pads. I'll show you exactly how to achieve this in the video tutorial below. Once my window was cut, I sandwiched my spider web between the card base and the card front. I used foam tape to adhere the card front on to the card base to give some dimension to the card. I love the way this intricate die cut fills the window. I added a little Wink Of Stella Clear Glitter Brush marker to the spider web to add shimmer. I adhered the rest of my images, including the pumpkins, sentiment strip and spider to my card. I also added some silver thread and sparkling clear sequins to give some shine to this Halloween card. Once I created my card, I used the same concepts to create a tag and a treat box. It's very easy to recreate a project in a different form once you have your design nailed down. The smaller size of the tag and treat box called for some slight adjustments, but they were quick and easy to figure out. For the tag, I used the My Favorite Things Stitched Traditional Tags dies. I love the stitched detail on the edge of these cards. In fact, I think if I were to create the card again, I might use a stitched rectangle die to die cut my card front. It's subtle details like the stitching that really adds just the right finishing touch to your projects. The smaller size of the tag called for just a couple of adjustments. Instead of two pumpkins, I used just one. I incorporated the same paper that I used on the card project, just in a little different way. I chose to layer it up with the sentiment strip instead of attaching it at the top like I did in the card. I knew the tag would have plenty going on at the top with the twine and thread I added, so keeping the focus concentrated in one area was the best choice for this project. The used the Lawn Fawn Pillow Box die for the treat box I created. This pillow box is perfect because it's large enough for a gift card and is also a great size for candy, jewelry or other small gifts. I chose to use Bazzill Card Shoppe card stock in Alpaca for my box base. Just wanted to switch it up from the stark white I was using. Once again, I chose to do a partial die cut window...but this required a little alteration to one of the tabs on the box to keep the tab from showing through the window. It was a quick fix, and I'll show you how I did it in the video tutorial. I also chose to back the window with some acetate. This allows me to fill the box with candy without it spilling out. Halloween may not be something you usually create cards for, but this concept would also be fantastic for flower dies, sentiments and many other types of die cuts and stamps. In fact, I'd love to see your spin on this idea. 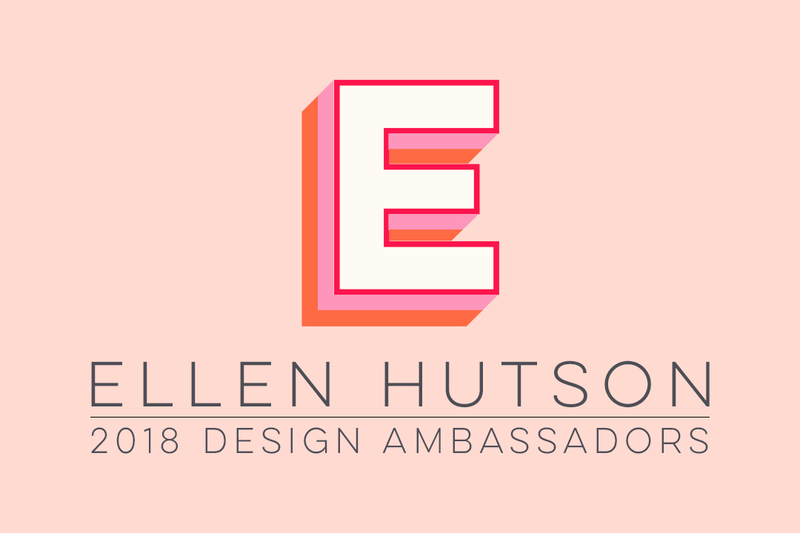 You can share the projects you create on Instagram or Twitter and use the hashtag #EllenHutsonSaturYay so that we can all see what you're creating! Thanks for stopping by today! I hope you've enjoyed this Peek A BOO edition of Satur-YAY! Until next month, I hope you have a fabulous day! To watch this video in HD on YouTube click HERE. Stripes. For a Thanksgiving card? Oh, yeaaaaah!!! And, this free-hand watercolored type stripe? Super easy with Distress Stains--like I mention in the video, I'm addicted to these things--all the colors must come live at my house! Weathered Wood is a lovely grey with hints of blue in the undertones... makes an awesome neutral and is perfect for the background of this greeting. Enjoy today's video in HD on our YouTube Channel HERE--thank you for giving it the thumbs' up, and for watching and subscribing! Hi, everyone, and happy weekend! It's finally cooling off down here in the deep south and I happened to get a decent photo of my girls at the end of last month, so I thought I would scrap it for my seasonal entry table display. I have a wrought iron easel on that table, which usually holds a seasonal art piece. Something to keep in mind when stamping onto a non-white cardstock is that the colors may appear a little darker than they normally do on white or ivory, so be sure to test them out first. For a little accent in the lower left corner of the page, I die cut two of the hole reinforcers from MFT's Blueprints 9 Die-namics (the large tag shape from that die set is what I used to frame the photo, which I'll get to in a moment), and then tied some of Lawn Fawn's Golden Sparkle Hemp through them and into a bow. Above you'll also see a tab from the same Blueprints 9 die set that I cut from Ellen's beautiful Curious Metallic Gold Leaf Cardstock and added to the bottom of the photo tag -- I'll do a little personal journaling on that later. Next, to create a little divider between the woodgrain stamp and the leaf pattern I created, I wanted to use this pretty Little B Thin Gold Stripes Tape but it was thinner than I wanted and it disappeared into the background more than I wanted, so I did this: I placed two rows of it onto Neenah Solar White cardstock and got a thicker 1/4-inch fun look I was going for! And now you can get a good look at that pretty, large tag I used to layer the photo on to. It measures 4" tall (in the sideways orientation I have it shown) x 5.25" wide and was cut from Bazzill Red Hots cardstock. Then I added the month with MFT's Accent It-Months of the Year Die-namics set and popped it up on Copic Foam Tape. Good Wednesday morning and welcome to the CLASSroom. One of my favorite styles of cards is white on white with small touches of color. I especially love to use this style with pops of red and green for Christmas holiday cards. I thought it would be fun to create an all white fall scene and adding a handful of brightly colored oak leaves. For my project today I used the newly released Impression Obsession Tree Frame, Oak Leaves and Rake and Bushel of Apples. The frame was created using the Nesting Card Templates. I know I showed this leaf coloring technique on my last CLASSroom project but I thought I would go ahead and show the pictures since I was coloring leaves on a much smaller scale. I used three colors applied in three sections on the leaves- Spiced Marmalade, Peeled Paint and Fired Brick. Apply each color ink with a mini applicator. Assemble bushel basket pieces with glossy accents. Attach leaves in basket with glossy accents starting with the front leaves first and working backwards to fill. Hint: I love using the tweezers from my Accessory Tool Kit for this job. Insert one (or as many as you like) colorful leaf in the basket. Attach several white leaves and a few colorful leaves to the tree branches with glossy accents. Cut a single frame and apply ATG adhesive to the back. Hand cut a small ground section and apply to the back of the frame. Attach the frame directly over top of the tree frame. Apply thin strips of mounting tape to the back of the frame and trunk and branches of the tree. Attach the framed tree to the card base. Attach the basket of leaves behind the ground section with a piece of mounting tape. Create a pile of leaves around the trunk of the tree and basket by arranging and attaching with glossy accents. Attach a few colorful leaves swirling and falling in the free space and a few more in the tree branches and ground area to finish. Here’s a closer view. It is really hard for me to capture good photos of white on white. I love how the leaves pop off the all white background. I hope you have been inspired to create a white on white project for your fall and holiday cards. Thanks for coming by and I will look forward to seeing you next time. As the official date of Fall/Autumn approaches here in the U.S. and the last of the warm summer temps leave, I found myself decorating my house for the next season. After hanging a wreath full of rich colorful leaves on my front door, I decided a Fall celebration card should be on the agenda! This one could be used to celebrate the season, Thanksgiving, or any other Fall occasion you might have this season (birthday, anniversary, etc). To be sure the die was centered in my 4-1/8" x 5-3/8" card front, I used Tim Holtz's Ruler. After die cutting, I sponged the white woodgrain card front with Antique Linen Distress Ink using the mini 1" Round Ink Blending Tool. To create the wreath, I used My Favorite Things Autumn Wreath Die-namics to cut several colors of Bazzill Card Shoppe cardstock: Gold Coins, Candy Corn or Circus Peanuts (orange), and Wax Lips (red). There are also three individual leaves included in this fantastic set -- I die cut six additional loose leaves from Peanut Fudge to add in. I found it easiest to achieve a full wreath by layering the leaf wreaths this way -- I left the gold wreath in tact to use as a base, then snipped apart the orange and red wreaths, about three leaves at a time. Then I used Copic's X-Press It Glue Marker to adhere the leaves together where I wanted them. The wreath was attached to the door/card front, then a banner greeting created with Altenew's Label Love stamp set, heat embossed with Ranger's Super Fine Gold Embossing Powder on a banner created with MFT's Dimensional Banners Die-namics cut from Bazzill's pretty Butter Mints (ivory) cardstock. It was folded and adhered with foam tape to the wreath. Good Wednesday morning and welcome to the CLASSroom. The fall season brings crisp, cool temperatures and a landscape palette of gorgeous colors. Living in Florida we do have slightly cooler temperatures in the fall but don’t experience the color changes. I have to celebrate the season by creating projects with the rich colors of fall. Last fall I presented a Leaves with PanPastel tutorial for In Touch. Today I’m going to show you another technique for coloring leaves with distress inks. I am using the Impression Obsession Leaves set paired with the Taylored Expressions Shade Tree Cutting Plate. I was playing with leaf coloring last week and made an accidental discovery. My die cut leaf had gotten a little black spot on it so I tried to wipe it off with a clean baby wipe before starting to apply ink. It didn’t remove the black spot but the light touch of moisture from the wipe made applying and blending the inks so smoothly. It was much nicer than dealing with the paper misted with water. This is what I refer to as a happy accident. I lightly dabbed (not rub) the leaf with a baby wipe to apply a light layer of moisture. I used five inks to color my leaves and applied the colors in patches to create the variegation of fall colors. Peeled Paint, Spiced Marmalade, Rusty Hinge, Fired Brick and Wild Honey. I started with Peeled Paint. I applied each color of ink with a Sofft Mini Applicator. Have I told you that these are one of my favorite go to tools for coloring? And no…..make up applicators do not work as well! Apply light touches of Fired Brick. The red is really pretty when blended in but can be overpowering if applied to heavy. Finish the leaf by lightly applying Wild Honey over top of all four colors and blending them all together. You can see how sponging the lighter ink over all the darker colors smoothes out the distinct lines. When I finished applying and blending the ink I placed the leaf face down on my Versa pad and dipped in clear embossing powder. You can see how embossing brightens all the colors on the leaf. I placed the leaf face down on my molding pad and formed it with the larger end of my stylus. I laughed as I took this picture because it seems I use these tools for every tutorial I do. Needless to say Susan’s Accessory Tool Kit has a prominent place on my work desk at all times. Thank you Susan! I thought you would enjoy seeing my small pile of leaves. Aren’t they pretty! Truth be told I didn’t have a project plan when I started making the leaves. But recently I played with water coloring the Taylored Expressions Shade Tree with a water brush and reinkers but laid it aside for a future project. I decided the tree would be beautiful framed and embellished with the pretty fall leaves. Thus….I have no pictures of coloring the tree. Sorry! I applied embossing powder over the whole tree to make it shine and match the leaves. I cut a frame using 5th largest die in the Nesting Card Template. I laid the frame over top of the card base and used it as a guide to stamp the sentiment from the Shade Tree Sentiments set with Gathered Twigs ink. I applied thin strips of mounting tape on the back of the frame and attached over top of the shade tree frame. I applied another layer of mounting tape to the back of the tree frame, tree trunk and a few leaves and attached it to the card base. I wanted the tree limbs to be popped up for dimension. I applied a piece of mounting tape to the back of each leaf and attached them in a cluster to the frame. Here’s a closer view of the leaves. I am thinking of cutting and coloring up a large bunch of these leaves and creating a full sized wreath. I hope my tutorial has given you inspiration to try making your own fall leaf project. I’ll look forward to seeing you next time. We are so excited to be welcoming Laurel Beard to the CLASSroom today! Laurel is a ray of sunshine in this crafting world - her enthusiasm and energy are so contagious! Her blog, Papercrafts by Laurel, along with her YouTube Channel, Laurel's Crafts, are a treasure trove of information. I'm not certain where she finds the time to do it all with two young children, but she does so with flair! Laurel is also founder of the Lawnscaping Challenges blog and this is where I first "met" her. It was the common love of the Lawn Fawn images that brought us together in this crafting world and I am a lucky lady to have her in my life. For even more learning opportunities (yes, Laurel has another project AND video awaiting you) you must visit Laurel's blog, Papercrafts by Laurel! I would appreciate if you would help us thank Laurel for sharing her creativity with us here in the CLASSroom today. Please leave your comment on her post about being a guest here by August 19th to be included in the random drawing she will be hosting. As our way of thank you for taking the time to do so you will have a chance to win some of the fabulous products she used in this post! You know you are in the right place if you see the following picture. Hi there! I am over the moon excited to be here at the CLASSroom today to share with you a few projects using some creative die cutting combined with some Design Memory Craft Faber Castell products!!! If you are like me, you like to stretch your products to get the most out of them, and that’s what I did here to get the most use out of this fabulous chevron die by My Favorite Things. After applying some Gathered Twigs distress ink, I stamped the sentiment from this stamp set in Versamark ink and heat set it with Ranger Black Sparkle Embossing Powder. I then grabbed some patterned paper scraps in my stash and die cut the pumpkin and leaves from this die set and voila, done! Let’s move on to the next card shall we? This time, I thought it would be fun to add some texture to the pumpkin! PERFECT time to pull out the Glass Bead Glitter Gel by Faber Castell!!! I tinted the medium by smooshing some Ripe Persimmon distress ink onto my work surface (I use the Ranger non-stick craft mat) and mixed in the glitter gel with a palette knife. I then added it to some cardstock and allowed it to dry (approximately 15 minutes). The texture and sparkle it leaves behind? WOW! While that was drying, I worked on my background panel. I decided to use the chevron die as a stencil so I die cut the chevron, layered it on top of my white card panel, and spritzed it with some Mister Huey’s spray. I use an old shoe box for this so I don’t have to clean up afterwords! Of course, I added some googly eyes and some twine for the pumpkin insides and popped it up on the misted chevron panel with some foam dimension... As a finishing step, I heat embossed the edges of my card base with some Enchanted Gold Embossing powder! To do this, I applied my Versamark pad directly to the edges of my card base, sprinkled on the powder and heat set. And finally, my last project to share with you today! A cute little place holder or treat bag! To create the cute little pumpkin panel, I used some Faber Castell Whipped Spackle. I tinted it with Gelatos.... The pumpkin is from the Impression Obsession stamp set I used in my first project. Simply color some gelato onto your work surface, grab some whipped spackle and blend together. I applied the spackle to the pumpkin using a palette knife, making sure I kept it uneven as I applied because I definitely wanted some texture and dimension. I allowed it to dry (about 15 minutes) and then fussy cut the pumkin. For the burlap bag, I used some burlap I had in my stash (actually came in a coffee club order, ha ha) but Ellen Hutson carries these cute burlap bags which would have made things much easier for me! I cut my burlap into a circle and cinched up the top and tied it together with some twine. Then I cut a hole in the top of the pumpkin to weave the twine through and voila! As a finishing touch, I heat embossed an “L” using the same Ranger Black Sparkle embossing powder I used for the sentiment in the first card. Hello and happy Fall, everyone! Cooler weather has finally made it down to the U.S. Gulf Coast, so it inspired me to do a little scrapbooking. I knew as soon as I saw this great "You are my sunshine" sentiment in the My Mind's Eye Chalk Studio patterned papers, I would use it on a scrap page of my daughters . . . I used to sing the song to both of them when they were little! I am LOVING MFT's growing line of pierced edge dies (circle, rectangle, square and tag) ... you can find them all HERE in Ellen's store. I know you'll be seeing a lot more projects from me using these sweet dies! And take a close look at how nicely they are packaged for you -- already on a magnetic storage sheet! Hopefully you can see the great pierced edge detail by clicking on the photos for a larger view. The pierced/stitched long rectangle piece divides the photo of my girls from the great leaf embellishments, and I used the stitched circle element to stamp Fall 2013 (from MFT's Document It Days and Dates clear stamp set). Tim Holtz's Tattered Leaves were die cut from more coordinating Chalk Studio patterned paper (sage and brown colors, to pick up tones in the photo) and were placed on a Prima ATC Stitched Canvas. My 8-inch page base is made from Hero Arts Layering Paper Mixed Sunshine -- to help resonate that great sunshine sentiment! I hope your Fall weekend is filled with sunshine, too! Fall in the PNW is pretty awesome--I love the turning of the leaves and the crispness in the air! I refer to that gorgeous leafy stamp by Impression Obsession as a "Maidenhair fern"--it looks like the beautiful ferns that I remember from when I was a kid and my gramma would take me to the Grotto. You folks that know your botanicals, what say you? Altho I have not used them yet, it should be noted that there are several other awesome products available that can also be used to achieve similar results, including the Derwent Inktense Blocks or the Derwent Inktense Pencils. Using a bleed-proof ink pad is critical for good watercolor results--I used one of my new favorites: Soft Granite by Hero Arts, and I also prefer to stamp and watercolor on Smooth Bristol--it has a great surface for getting a crisp impression and it's also fantastic for the quick and easy watercoloring I like to do! Enjoy the video here or over there on YouTube! Thank you for joining us today and for subscribing to our channel! Paper Trimmer, Tonic Guillotine 8 1/2"
I had to laugh when I finished this design because while it goes completely and utterly against my "Type A" personality (Type A's, you know who you are! *chuckle*), I absolutely adore Mister Huey's Color Mists! I can't stop using them! They are a GREAT short-cut for adding a quick splash of color* and I love the way the random splotches add interest, depth and texture without me even having to work at it, all with just a few spritzes. Another great short-cut on this design: POW! Glitter Paper. This stuff is WOW! You can punch it, die cut it, use decorative blades on it (rotary or hand-held scissor type), fold it, yadda yadda! It has a thin backing, as opposed to card stock, altho with intricate dies, I would probably back it with card stock to make it sturdier for that. Most astonishing, is that NONE of the glitter flakes off when you rub your fingers across the surface or manipulate it! It's velvety smooth! I think they should make it in every color of the rainbow. I do indeed. WOW + Paper = POW! I totally get why they call it that. If you need full size sheets of glitter for a project, these are amazing! Great gobs of glitter, Batman!!! I also love the woodgrain pattern built right in to the Savvy Woodland Tree die--a great detail! Enjoy the video here or on YouTube and thanks for subscribing to our channel! *DESIGNER NOTE: I used "Sunshine" Mister Huey on this week's project, but just realized it is no longer available; a similar color and suitable substitute for this burnt orange hue would be "Desert"
Freestyle collage is a popular trend right now in paper crafts that I am completely intrigued by! I'm particularly fond of the ones that embrace white space (if you know me at all, you know how I adore me some white space, and lots of it!) and feature a small, tightly clustered group of design elements. The fact that the elements are deliberately and slightly askew adds to the charm and is also rather liberating and fun! Enjoy the video here or in HD over on YouTube! I had seriously way too much fun making this Halloween design--this tiny shopping bag is to die for--LITERALLY!!! I can't help but have a lot of fun when it comes to Halloween--it's the Mister's birthday! Candy, cake AND ice cream???!!! Oh, yeah, baby!!! This week's video shows you how the whole thing came together and you can watch it right here, or hop over to YouTube to watch it in HD! Enjoy! Here's a super fun way to add some texture to your paper craft projects! I've been fascinated with Real Wood Paper and the fact that it can be cut by hand, die cut, and even embossed much like regular card stock, making it a very interesting supply to create with! The added texture of Sage colored Flower Soft creates the illusion of "moss"--have you seen those fun moss-covered home decor letters and terrariums? I think they're so cool looking, and it's fun to recreate a bit of that style and effect on a card! You can watch the video here or directly on YouTube in HD. Perhaps this design will spark other ideas for you to try the next time you sit down to create! With World Card Making Day tomorrow we wanted to start off with some FUN today! Be certain to note that we have TWO posts for you today! Please join me in welcoming our guest designer Jean Manis in the following post, as well carefully read through this post being we have a special discount for EVERYONE who participates in this challenge AND a discount code for shopping today and tomorrow! Over the next two days we will be offering you a MULTITUDE of challenges to participate in and prizes to win!!! So be certain to return again tomorrow! For today and tomorrow we have a special shopping discount for you - if you place an order with us at www.ellenhutson.com either today or tomorrow please use the code WCMD2012 to receive 15% off everything in-stock on your order except Copic products! It is such a privilege to be sponsoring the Lawnscaping Challenges fall blog hop!!! When Laurel sent me the badge for the hop I just had to create using it AND I wanted for each of you to have the opportunity to participate as well! After you have completed hopping we hope you feel incredibly inspired and will get busy creating because we have a FABULOUS surprise for those who take this on. We will be offering a one-time discount code to all participants who create a project following the directions below! you have one week to complete your project - deadline is Friday, October 12th! Watch the little timer on the InLinkz at the bottom of this post for exact time left. Be certain to head over to the Lawnscaping Challenge Blog for additional fun and more blog candy!!! When I first saw the blog hop badge I couldn't help but have flowers on my brain - I just love these big, beautiful sunflower blossoms! I have been wanting to try a fabulous idea I had pinned to my Pinterest board that brought me back to elementary school days when we wrapped tin cans with string and yarn. Everything just seemed to come together when it dawned on me that Lawn Fawn has the most fabulous hemp! Mason jars are a hot trend right now! So what better and more fun way to use your crafty supplies than to create an up-to-date centerpiece for the upcoming Thanksgiving festivities! I must admit I didn't part with one of my pretty Mason jars, but rather used a pickle jar that had just been washed to recycle. Begin by applying two rows of 2 1/2" Be-Creative (Sookwang) tape to your jar. I worked from the bottom up, only removing the protective covering from the lower portion of the tape. This made it easy to hold on to the jar and wrap the hemp as shown in the photo above. Hide the "tails" of the hemp as shown above. I like to work using odd numbers - the look is always more balanced that way. So I started with 5 rows of the mustard, 3 rows of the teal, etc. When you complete your last row simply tuck the tail end beneath the previous row. I used my craft knife to help me gently lift the previous row and tuck the end in place. Then use the knife to scrape away any excessive adhesive and an adhesive eraser to eliminate any tape remains. To create the tag I embossed the die cut Desert Storm tag and added this fabulous cornucopia from Lawn Fawn's Harvest set. Coloring on the Desert Storm paper using Prismacolor pencils gives a warm look to the completed image! I couldn't resist creating a second tag using the same stamp set - this tag being a little more modern in appearance. Mount all three leaf stamps on an acrylic block and stamp multiple times using Distress Embossing ink. Then apply Adirondack's Butterscotch embossing powder and heat set it. This embossing powder is a perfect coordinate to the Lawn Fawn hemp! To create the coordinating ribbon colored a segment of 1/4" silk ribbon with coordinating Copic markers. Can you imagine little jelly jars done in this manner and situated at each place setting?!! You could write individual names on the tags and use them as place holders or line them up down the center of the table and use as a centerpiece. I hope that this inspires you to go and pull out your Lawn Fawn stamps and join in this fun challenge! Who better to join in sharing some fabulous inspiration for our portion of the Lawnscaping Fall Blog Hop challenge than the talented artist who introduced me to these fun challenges!! Today I am so very excited to share the beautiful work of Jean Manis with you! It was about a year and a half ago when I first met Jean at a school related function, little did I know at that time what an avid paper crafter she was. Over the past short months I have had the pleasure of getting to know Jean better as she stops in here at our office/warehouse. It was during one of those visits that she shared how much she enjoyed the Lawnscaping challenges. Jean is on both the Simple Scrapper and the Neat and Tangled Design Teams and she shares more of her gorgeous work on her blog Right as Rain. I would like to invite you to head over to Jean's blog to be inspired and leave some comments for her! Being Jean does not have ready access to her in-box this weekend please join me in welcoming Jean here in the CLASSroom by leaving a comment for her here on this post! You will have until midnight October 7, 2012 Pacific Daylight Time to share your thoughts and be included in our random drawing for some of the fun products Jean used to create this fabulous fall forest for the Lawnscaping Fall Blog Hop Challenge! Head to the bottom of this post to find the comments section! With each card I make I set out to make an improvement in some way – try a new design, try a new technique or polish my stamping or card-making skills. To that end, I have two tips to share. To “season” the solid trees in the Lawn Fawn “Let It Snow” set, I used a sanding block from Lucky Squirrel. Stamped with black Ranger Archival ink, you can see that my first tree (on the far right) has some splotches. I sanded the stamp, on the stamping block, lightly and then stamped again (middle image). I wanted to err on the side of under-sanding rather than over sanding. Since I still had a little bit of splotch, I sanded a bit more and finally achieved a clean solid image (on the far left). I clear-embossed the owl stamped with Versafine black ink. I find that having the embossed edge makes my paper-piecing easier. There’s something about that raised barrier. I stamped and embossed the owl several times, using the owl stamped on Memory Box Vanilla Bean cardstock as the base. Another tip I wanted to share, which I learned from Chari Moss http://www.mossymade.com/, is to use a marker on the edges of cut stamped pieces. This tip was especially useful when I cut out the owl’s eyes, since I didn’t want there to be any white paper outside of the stamped image. Holding the cut paper with tweezers, due to its size, I went around the edge with a Memento marker. It’s best to dedicate a marker to this task as the fibers of the marker will eventually get paper cuts that could lead to bleeding when you use the marker to color. I stamped the solid trees from the “Let It Snow” set for the forest foreground using “Peeled Paint” and “Forest Moss” Distress inks. These inks paired nicely together color-wise and provide a watercolor-like effect when stamped with the solid tree. I wanted the forest to have a natural feel to it. Three fussy-cut trees sit in the foreground of my scene. I stamped the background forest with the open trees in the set using the same two ink colors. I wanted there to be some overlap to create a cluster. The tallest cut tree was adhered directly to the background; I used 1/16” 3-D dots for the other two solid trees. I used 1/8” 3-D dots to adhere the owl and stapled the banner for a metallic accent. Going back to my card-making goals, I periodically like to try a different approach. In this case, the “Winter Owl” stamp was one that I wanted to try Copic coloring. This owl uses brown Versafine ink, rather than black, and is clear embossed. I’m a novice when it comes to using my Copics, so my owl doesn’t include any shading. The Copic-colored approach was definitely less time-consuming than the paper-pieced one. Using the colorless blender, I “added” polka dots to the scarf. I hope my recent post has you thinking about new ways of using your dies together with tissue paper! When thinking about what makes tissue paper unique I remembered that when wet, color puddles form... and it dawned on me - I could use it as a watercolor medium! Begin with watercolor paper - in this case I used Hero Arts felt finish paper. My guess is that the Jennifer's watercolor paper we carry, would work even better. OR if you have Julie's Bristol you could try that as well. I just didn't have quite enough time to try all three and do a side-by-side comparison that day. Be certain to watch for an update as I give that a try! To create a watercolor background spritz your watercolor paper with water (I'm going to have to try Perfect Pearls mists and Studio Calico mists soon as well!) Position your die cut leaves randomly atop the paper. Continue to spritz and lay down more leaves until your sheet is covered. It is hard to believe that fall is in the air! The air is crisp now in the evenings and mornings and the leaves are beginning to turn. This time of year brings SO much inspiration! It was while putting together a birthday package that this idea came to mind and I really think that it is going to trigger something fun in each of your minds. This is the first of a couple of different ideas I am sharing using tissue paper and die cuts, so let the fun begin! Claudine's video on how to use Studio Multi-Medium (find it at this link) will come in handy when creating a project similar to this. The beauty of tissue paper is that it is semi-transparent one wet and when it dries the pattern of the stamped image below shows through. Die cut various colors of tissue paper - I was able to cut through at least 6 sheets of tissue paper at one time. You will need to carefully pull the sheets apart once they are removed. I began by stamping through a circular mask on to linen cardstock using the Hero Arts woodgrain stamp - LOVE this stamp! Be certain to use a waterproof ink such as Archival ink. Apply a thin layer of Multi-medium to the cardstock surface and place your tissue paper leaf in the wet area and paint over the entire leaf using more Multi-medium. If you are uncertain of leaf placement allow the first piece to dry, or if you are confident in your layout just keep working. Add a leaf at a time until your project is complete. To adhere the letters I held each one using a pair of tweezers and applied Multi-medium to the back side of each letter. Multi-medium dries clear and is a phenomenal adhesive. I liked using it for this project because it allowed me to scotch the letters around on the wet surface until I had them perfectly straight. Tweezers are an absolute must for crafting in my opinion! Before you know it, it will be time for Thanksgiving. If you're American, you still have lots of time to prepare, but if you're Canadian like me, well... you have a couple days left. Today I have a couple quick projects that are fun and festive for the season. Better yet, you can easily change them up to suit any occasion. As I looked through my supplies, I realized that I didn't have anything directly Thanksgiving themed on hand. But that's ok. By using what I have creatively, I can design for almost any occasion. To start off my card I stamped the card base in white ink with this Hero Arts stamp. It adds a great distressed look which always works for a fall-themed card. I wanted the text to be the background and also on the die cut leaf. I could have just stamped the card after I'd adhered the leaf but with even the slight difference in surface height between the papers, I'd would have ended up with a halo like effect and the text would not have stamped cleanly right through. First of all, stamp the text directly onto the card base. Sorry, I forgot to take a photo of this step but it's pretty basic, right? I wanted my leaf to be an exact way across the text for design purposes but also wanted the text stamped on the leaf to line up perfectly with the text beneath it. By laying my die cut leaf on the text stamp scrap paper, I can see exactly how I want me leaf to be on the final card and also easily line up the text. Once you have the leaf lined up the scrap paper, stamp the text onto the leaf and remove the leaf. Now you can line it up perfectly onto the text on the card for a seamless look. It's really quick and easy and gives a great look. Try it and see! To finish off my card, I stamped my sentiment onto some Sticky-Back Canvas and stapled it on. A sanded button adds a fun look and the twine adds a tiny hit of color. Next I decided to make a few quick pillow boxes to hold treats on my Thanksgiving table. I've used the new Lily Bee Harvest Market Collection Kit for these little boxes and also for the die cut leaf in the above card. When you're creating for a crowd, it's always a good idea to keep it simple so that you don't get overwhelmed. Simple is classic and always in style. These little boxes are die cut from the Sizzix Bigz Pillow Box die and are so easy to put together. You can even die cut a couple layers of paper at a time to speed things up even more.I just adore this Sizzix die. It's a timeless must-have in my opinion! This time I've used a different leaf that is die cut using the same die and sanded the edges to define them. Wrapping them with twine and add a Leaf Trinket Pin quickly finishes off the project. Thanks so much for joining me today in the CLASSroom! Hope you enjoy creating for Fall! To start this project, I decoupaged (using Royal Coat Decoupage) some neutral papers from Authentique's 6x6 Glowing patterned paper onto a 12-inch MDF photo frame from a local craft store (I liked the nice, large 5" x 7" opening). I always put a final coat of decoupage glue over the top of the patterned paper, to make it more resilient. I finished the edges of the frame with Studio Sable Brown Acrylic Paint. To make the cascading leaves, I die cut leaves out of several fabulous colors of 100% wool felt Ellen carries: Butter, Dark Sage, Rhubarb and Terra Cotta, using Tim Holtz Tattered Leaves Bigz Die. This felt is wonderfully thick, but this die cuts it like butter! The branch was secured to the frame using one of Tim Holtz's Hinge Clips, so I could have the option of maybe switching out this branch with a different seasonal decoration in the future. Plus, the clip holds things nice and securely! The clip was attached to the frame using Glossy Accents -- it's also a great quick-drying permanent glue! To accent the clip, I tied some black and brown Baker's Twine to the top. To accent the top right corner of the frame, more leaves were die cut from Nutmeg felt, machine stitched, and accented with a large brown button tied with brown twine. For the FALL tiles at the bottom, I used Inchie Arts Neutral Inchie Squares (Dark Cream) and embossed them with Tim Holtz's Bricked Texture Fades Embossing Folder. (The Inchie on the left above has not been texturized yet). Then I painted the Inchies with Copper Adirondack Acrylic Metallic Paint Dabber and topped them with Maya Road Mini Alphabet Chipboard Letters that were painted with metallic Gold Paint Dabber. To finish this frame, I chose a few cute patterned papers from My Mind's Eye Mischievous 6x6 pad and made a photo mat, ready for a new Fall photo with a couple of mischievous little girls I know (namely my 9 and 11 year olds)! I'll admit it--I very rarely "distress" anything--I love the look, it's just not a technique that automatically pops into my head. BUT . . . (you knew that was comin', right?!) I adore kraft paper, and when I saw this color coated kraft paper, I had to play with it a little! It has a little linen like texture, and when you sand through the color, the kraft core is revealed! TOTALLY WICKED!!! I needed a moon. Not just any moon. A BIG moon! So, I grabbed a larger EK Success circle punch and punched a circle from masking paper. You could use Eclipse Tape, too. These are great for larger images and when you need ALL the edges securely tacked down while you are working. Sponging right over the top with dye ink was quick & easy . . . Tip: When sponging ink, you can achieve a smoother blended look--almost airbrushed in appearance--by hitting the paper with a circular motion, as opposed to "pouncing". When I removed the mask, I had a nice "orb" to serve as a back-drop to my focal image. This really makes the silhouette of the crow & fence "pop"! Snagged a black button and bow-tied it with some ivory twine (both from my stash) for just a little adornment and voilá! I really like how it turned out! And, it was ridiculously easy! Isn't that an awesome effect?! Often I have a stamp that I just adore that doesn't get enough face time before the season changes, so what could be better than thinking of ways to give it a little extra love? Often a simple adjustment can be made with masking, or using different colors when stamping it. But sometimes the theme is so seasonal that those adjustments won't do the trick. That was the case that I had with the Hero Arts stamp set Say Hello. A very fun and whimsical group of images that I love to use and coloring in the little leaves and flowers in the Spring and Summer was very fun. But now with the leaves changing and Thanksgiving on our minds I wanted to create a card with this image that I could share with a friend who has really been there for me. So with a few patterned papers from the Cosmo Cricket Togetherness line, a Quickie Glue Pen, some Spiced Marmalade and Scattered Straw Stickles, a Peach colored Copic Spica pen and Walnut Stain Distress ink I gave this adorable tree some fall flair. First stamp out the image onto a few of the patterned papers and fussy cut out a few of the leaves from each color. Use the Quickie Glue Pen to adhere them in place, and then scatter a few of the extras along the bottom for the fallen leaves. Color in the smaller leaves with the Peach colored spica pen. Adhere the cute little owl into the tree using 3-D Foam squares for a little extra bit of dimension. On the inside of the Kraft Hero Arts card base stamp the sentiment from the Essential Message set. Easy to make quite a few of at once, this could be changed up a little and made into an adorable Christmas card as well. So I want to leave you with this challenge, look at your stamps with a fresh eye and see if you can take some of them from one season to the next. You will get more value from your crafting dollar and be proud of yourself when you are done! I decided it was time for another one of my 6-inch scrapbooking-for-the-fridge magnets, especially since Fall, with its changing leaves, is one of my very favorite times of the year! I've had a piece of corregated cardboard box torn up and waiting for a great idea to hit me on how to use it and I wondered if it could be die cut. The answer -- most definitely yes! To start, just cut up any regular old cardboard box into pieces that will fit through your die cut machine, and then peel the layers apart, to reveal the corregation on the inside layers. At first, I thought the sandwich might be too tight and took out the magnetic spacer (or white cutting plate, depending on your Wizard model) piece of my Wizard sandwich but sure enough, it was needed (but a bit tight). The result was a wonderfully embossed and very well cut leaf! After die cutting and inking the edges of the cardboard leaf with Brushed Corduroy Distress Ink, I cut a piece of Basic Grey Pyrus patterned paper with the middle-sized Nested Maple Leaf die to layer on top of the cardboard leaf. I sanded the embossed edges of the paper leaf, after inking the edges -- I love this look! A Hero Arts Fancy Felt Flower and a button tied with twine finish the leaf embellishement. To finish my page (6 inches, cut from olive Basic Grey Pyrus patterned paper), I added a Jenni Bowlin Vintage Mini Bingo Card and FALL letters die cut with the Sizzix Tim Holtz Vintage Market Alpha die from more Pyrus patterned paper. TIP: Outline your die cuts with a Copic marker -- this will really help define them and make them jump off your page, instead of blending in, unnoticed! Here, I used 110-Special Black. Zig 2-Way Fine Tip Glue Pen makes it easy to glue down small die cuts. Oh, and I can't forget the film strip of photos I printed of my sweet (most of the time!) daughters! By adhering Inchie Arts Inchie Magnets on the back of my 6-inch page, it becomes refrigerator art, holding the school lunch menu or other important school papers we refer to each day! When the season is over, place the page in a brag book album. I've been wanting to alter this 7 Gypsies Black Photo Tray for quite some time now and finally decided on just the project for it ... a seasonal home decor piece! So you are likely to see this tray again, just revamped for each season! I adhered each 4" x 6" panel in place with repositionable adhesive, so the panels can be changed out easily. Overall, this tray measures approximately 13" square. The Copics I used here were E08 and YG03. You could just use the letters like this, but wait -- glitter makes everything better, in my opinion, and is my favorite thing lately, so let's glitter up these babies! To do so, I ran the colored chipboard letters through my Xyron Sticker Maker and then covered the letters with Glitter Ritz Microfine Glitters in Chartreuse and Spice Brown. The triangles were strung together with twine to form a banner. The large bird on the left is a Maya Road Song Bird Coaster, covered in more Basic Grey Pyrus paper. The edges were also sanded and the tail tied with twine. The teal flower on the top right was cut from some of the Pyrus patterned papers and a yellow gemstone crystal added to the center. This photo was taken in the bright sunshine -- hopefully you can see how gorgeous the glitter is, in a closer view (click on any photo for a closer view). I hope this gives you some ideas on how you can use this fabulous photo tray -- you can even tuck in a few family photos as the season goes along. Then I'm thinking each of these 4" x 6" removable panels can then be taken out of the tray after the season ends and put into a scrapbook! I loved to do themed birthday parties for my family when I was younger - LOL! OK, I still love to do them, but I just don't seem to have the same amount of time as I once did. For Maddi's 5th birthday party we did an elaborate Alice in Wonderland themed party in which Maddi wore a special Alice in Wonderland dress I had sewed. I dressed up as the White Rabbit, my DH was the Mad Hatter and other friends took on the role of the other characters in this fun tale. I painted large props with characters and scenery for games and created loads of beautiful colored tissue paper flowers. Our back yard was quite the Wonderland. When Graphic 45 released this line of papers I knew immediately that I would have to do something birthday oriented. It was shortly after, that I saw Karen Lockhart's latest release and knew that the Pumpkin Cupcake was THE perfect fit. I felt that this card needed a "hole" to represent Alice falling down the rabbit hole. I am so literal - LOL! I don't know where these goofy ideas come from, but they do and so I just need to run with them. I first applied the black rabbit paper, then a strip of adhesive, next the striped paper and last another strip of adhesive. Next I cut the circle out using a Nestability. Black ultrafine glitter was applied to the adhesive strip and burnished in place using the burnished velvet technique. I am absolutely loving the touch of elegance this glitter gives my creations! Humor makes me happy and I am always trying to come up with little quips and so I created my custom saying using a font called Harrington in Office Word. I punched out the sentiments with my tag dies and distressed with Antique Linen. I sewed the last of my tags to the Jabberwocky paper and closed my card to place the Pumpkin Cupcake perfectly in the center of the hole. It was shortly after placing the cupcake that I realized I could have and perhaps should have created a little "flame" to place atop the cupcake. One little tip that I would like to share in creating this cupcakes coloring to coordinate with the Graphic 45 papers is to color your image with your true bright Copic markers and then once you have the look completed color over the surface of the entire pumpkin with a W2 marker. This helps to bring down the brightness of the colors and allows the colors to blend more accurately with the colors in the papers. Always remember that you can alter your Copic colors with your neutrals! Yes, it has been months since I wanted to share this technique with you. Finally... I hope that you enjoy it and that it was worth the wait - LOL! As you all know I am a true-blue Scor-It girl. When I want a score line to fold a card I believe that there is no better tool than the Scor-It. BUT that is not to say that tools like the new Martha Stewart Scoreboard don't have their place in my workroom - LOL! Yes, the gadget girl does like this gadget! It is perfect for creating texture details on cards, doing accordion folds to create the lovely flowers we are seeing all over the place right now and so much more. Waaaaay back I created a series of embossed cards that made quite a statement. It wasn't nearly as easy as the way that I created the card today. Rather it took some tape on my old Fiskars cutting/scoring tool to get my angles and a lot of determination to stay "in the lines" to create the look on this card. I love how the texture on the card front emulates the look of the basket. Repeating elements within a focal point can create a stronger look. I know I could have stepped this design up a notch, or perhaps two ;-D if I wanted. The 1/8" incremental difference allows for loads of textural combinations. To create the look simply position the corner angle piece as shown. Then score every 1/2" using an embossing stylus. I prefer to use an embossing stylus with my scoring board as it does not slip outside the lines as I work. It is also so very easy to create the score line right up to the edge of the side rails or corner angle tool. Change the direction of the card and repeat to create squares. You could stop at this point, but I really loved the look of the grid in the Lockhart stamp basket. Using a piercing bug run it down the score line. When you work with this tool on the scoring board I would like to recommend that you position your card front away from the rails to more easily run it off both edges of the paper for a more even look. You will also want to practice and hold the tool in an upright, completely vertical, position to minimize the chance of jumping outside the guidelines.